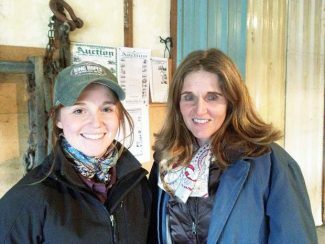 Suzie and Sarah Notti with the Notti Ranch of Otter, Mont., purchased a some good bulls. The Biddick Ranch of Laramie, Wyoming, walked away with the high selling bull at $10,750. Lot 13, Pass Creek 0035 982 4052, is a SAV Final Answer 0035 son with EPDs of BW 1.7, WW 59, YW 97, and Milk 23. He was born Feb. 15, 2014, weighing 90 pounds and weaned off weighing 835 pounds Couldn't help but like this bull. They didn't stop there; purchasing Lot 5, Pass Creek 13 0203 4023, for $9,250, the Biddick Ranch also won the bid on the B/R New Frontier 095-13 son. His EPDs include BW 1.3, WW 42, YW 80, and Milk 25. He was born March 11, 2014, weighing 77 pounds and posted 725 pounds at weaning. Lot 79, Pass Creek Romeo 967 3145, another Romeo son, sold to Dave and Barb Hoyt of Leiter, Wyoming, for $8,250. Another fall bull with EPDs of BW -0.2, WW 43, YW 89, and Milk 21. He weighed 75 pounds at birth on Aug. 17, 2013 and 655 pounds at weaning.